A Schmidt & Bender weapon scope is a synonym for quality and precision, for tradition and innovation. As early as 1957 the family business engaged in the development, production and optimization of riflescopes that always meet the ever increasing requirements in this segment. MSS Defence is proud to present Schmidt & Bender‘s newest version of the 1-8x24 PM IITM ShortDotTM CC, referred to as the 1-8x24 PM IITM ShortDotTM Dual CC, which represents the latest development of this proven 8x magnification riflescope. This is a most technically advanced day scope, with a true 8x zoom, as well as a true 1x power setting. 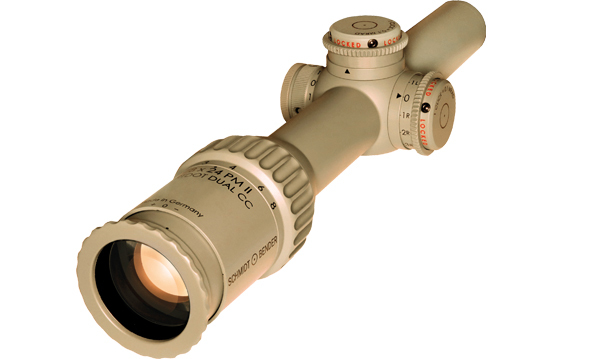 At 1x setting, it is an ideal both eyes open optical sight. When zoomed to 8x, the operator can easily identify and engage distant targets. It incorporates a first focal plane Mil-Dot based reticle for accurate ranging and compensation for hold-offs, hold-under, and hold-over. It offers an adjustable intensity illumination in the form of a distinctive and highly visible center dot in the second focal plane. The elevation and windage turrets are lockable to protect the zero position against unintentional adjustment. These combined features create the most advanced multi-purpose close combat and mid-range day scope design. The 1-8x24 PM II™ ShortDot™ Dual CC offers the shooter a strong advantage from their riflescope, as it serves as both a reflex sight for close quarter combat and a riflescope for short to medium distances. In turn, this allows for fewer devices to be placed atop the firearm. Less bulk, and less weight, equates to a more intelligent design.